Anne is one of our guides from Trek Tours Australia. She’s hiking our first day with us while our other guide, Elise, drives our bags on to the private camp at Standley Chasm where we’ll spend the night. Anne is a straight shooter. She doesn’t beat around the bush, but she’s as open, friendly and hilarious as they come. The group has a collective nervous chuckle at Anne’s comment, but we all nod in agreement, however unsure we are. We’re gathered under the shelter at the start of section 3, anxiously waiting to start our Larapinta adventure. Anne uses the information board at the shelter to fill us in on what to expect for the day. She finishes with a safety briefing, and then we’re on our way up the dry sandy bed of Jay Creek towards Fish Hole. We mostly stick together as a group, so Anne uses the time to teach us a bit about the history of the sacred place we’re headed for. “This place is women’s business,” she says, explaining that we’re following the footsteps of the ancient women of this land. Indigenous history is one of my favourite things to hear about on a hike, so I’m always stoked when a guide knows their stuff. As Australians, we’re shamefully lacking in knowledge on the subject, to the point where it’s hard to learn about it even if you go looking for information. 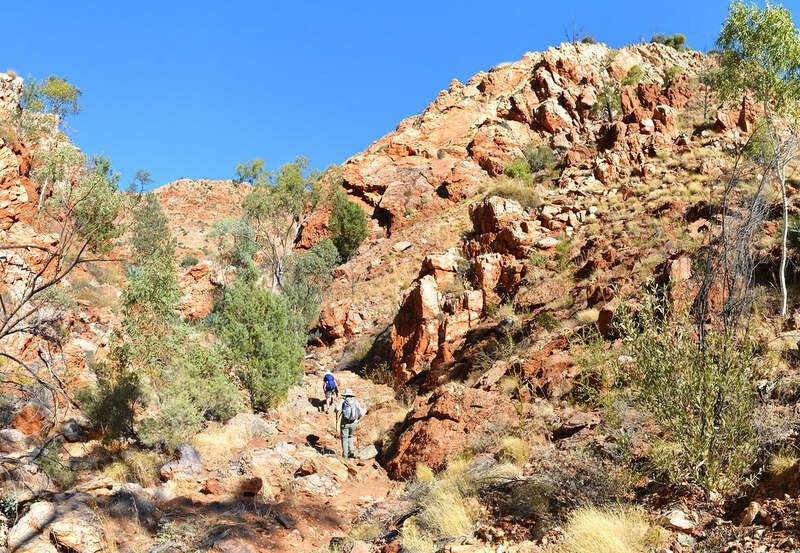 Soon the sandy creek bed turns rocky, and we get our first taste of the tricky terrain that the Larapinta Trail has in store for us. The rock hopping is a nice change from the trudging through sand, but we haven’t seen anything yet. 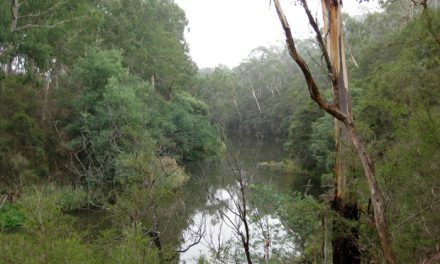 We round a corner and our path along the creek is blocked by a large, deep pool with high cliffs on either side. Ghost gums cling to their rocky faces. We stop to rest and take it in. I can feel that, but I’m still surprised. It’s nice to know there’s still some respect out here for the indigenous ways. Rock hopping up the dry bed of Jay Creek. Having chosen to take an optional high route up onto the quartzite ridges of the Chewings Range, we’re all glad when after a couple of kilometres we find a sheltered spot to have lunch out of the wind. We sit and rest our tired legs while we watch Anne lay out the incredible array of ingredients for our DIY salad rolls. My eyes turn to a pair of massive birds soaring swiftly above us, and I zone out completely to what the rest of the group is saying. Just as I start watching, a third, smaller eagle joins them, struggling to keep up. Together, they glide straight over the top of us, dive down into the valley and then swoop up again. I lose sight of them when they’re specks over a far ridge. All of this happens quite quickly, but I’ve lost any concept of time. When I snap out of it, I’m left with a feeling of smallness and irrelevance, but at the same time I feel more connected and present than I’ve felt all day. We make our rolls and have a good chat over lunch, and then it’s time to descend from the range. 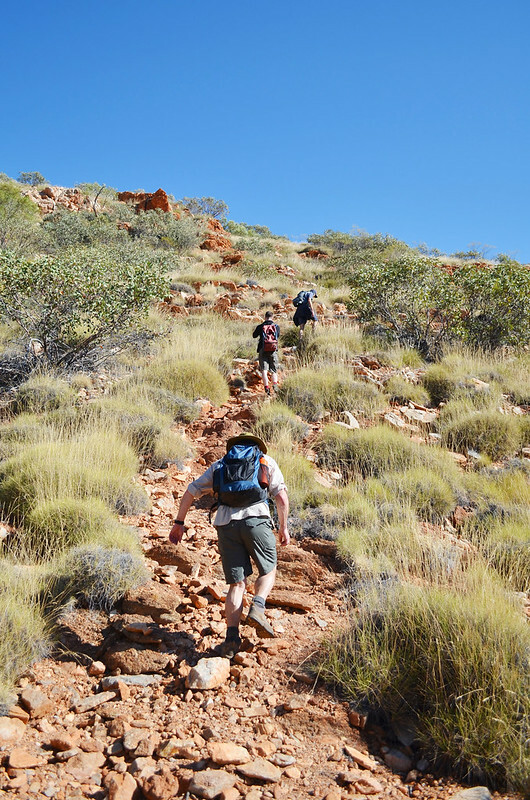 It’s a steep descent on loose rocky scree, so we stick together and move slowly. 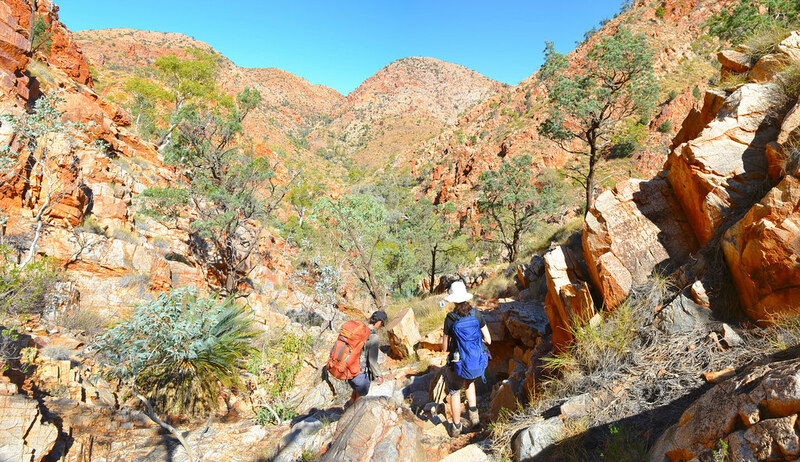 The vegetation around us becomes thicker as we make our way down into the valley, and before long we’re surrounded by huge ancient Macdonnell Ranges Cycads. By the end of our steep descent, we’re pushing our way through their massive palm-like fronds. “They’re believed to have grown here for about 200 million years,” Anne tells us. I stop and look around, trying to imagine what this landscape would’ve looked like back then; its peaks and ridgelines much higher, having suffered the elements for fewer years, and probably teeming with prehistoric creatures. The steep ascent onto the high ridges of the Chewings Range. dangerous but their bite isn’t the nicest feeling. Traversing the rocky ridge on the optional high route. Anne leads the way to our lunch spot. Descending back into the valley is tough but the scenery is incredible. Just when we reach a valley floor, it’s time to head back up again. I reach the bottom of what feels like the longest rocky staircase I’ve ever encountered, and find myself at a junction where I can either take a short detour into the famous Standley Chasm, or head to the Standley Chasm Campground where we’ve planned to meet. It’s the end of a very long day of hiking and I consider skipping the Chasm to go and find somewhere to sit and assess the hot spots on my feet. A couple of small groups of day-trippers stroll past me, some wearing thongs and carrying handbags, others smoking cigarettes; not making my decision any easier. It occurs to me that it might be a long time before I get the chance to revisit, so I opt for the detour. Standley’s walls rise quickly around me. There’s no doubt it’s an impressive site – its enormity makes the day-trippers ahead of me look like tiny figurines – but compared to everything else I’ve seen today I can’t help but feel a little underwhelmed. Retreating back to the campground, I grab myself a sports drink from the café and relax while the rest of the group gathers. Then we pile into the back of the 4WD (which Elise has left here for us) and head a short way down the road to Trek Tours AUstralia’s private camp. It’s impressively laid out with a large covered kitchen area, a fireplace surrounded by comfy chairs, and stand-up safari tents dotted amongst the vegetation. We’re allocated a swag each, and given the option to sleep under the stars or use the swag inside our tent. Based on this being our only night planned at a private camp, I head for one of the tents, where I set up and give myself a wet wipe bath. With the sun starting to dip behind the mountains, the cold is creeping in, so I don some warm clothes and join the group for a hard-earned beer while the guides cook dinner. Around the fire with an incredible day’s hiking to reflect on, the group starts to bond and learn about each other. I realise how important it is on a trip like this to feel a fondness for the people you’re experiencing it with, and I can already see that starting to come together. I always find it fascinating on these trips, to watch these people from such a wide range of ages and backgrounds form a cohesive unit as the trip progresses. We enjoy perfectly cooked steaks and salads while we look up at the night sky, unpolluted by the lights of civilisation. Someone plays ukulele. The conversations dart from jobs to families, and then to the excited anticipation of the five days of hiking that remain. We couldn’t ask for a better first night of our trip, but I’m absolutely knackered, so it’s not long before I bid the group goodnight and turn in. 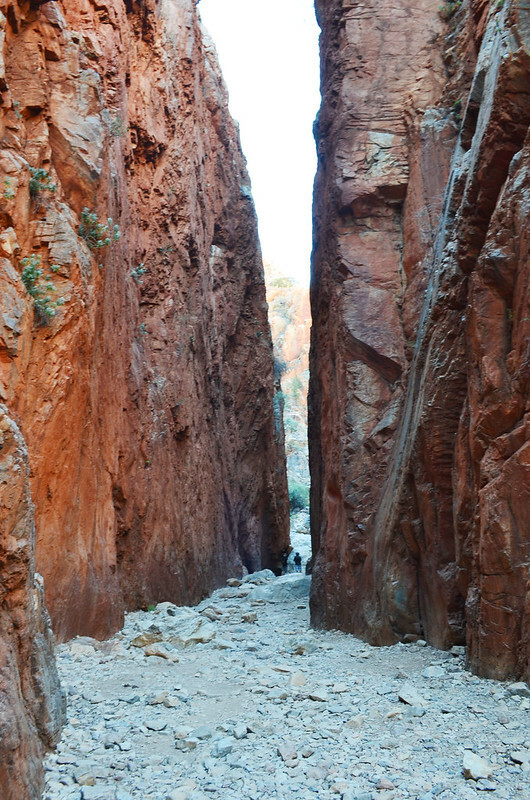 The high walls of Standley Chasm. moon still hanging low in the sky. 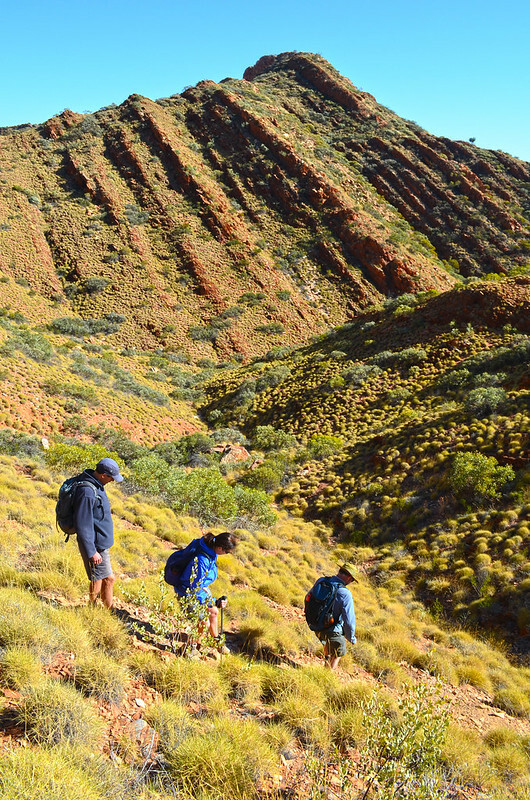 It’s day two and we’ve climbed from another dry creek bed near the campsite, back up onto the high ridges of the Chewings Range. There’s something different around every corner on this trail. I’m in a constant state of awe and there are times when it’s overwhelming trying to take it all in. Looking across the surrounding valleys, there are patterns on every hillside. They remind me of Aboriginal paintings with their lines and dots. 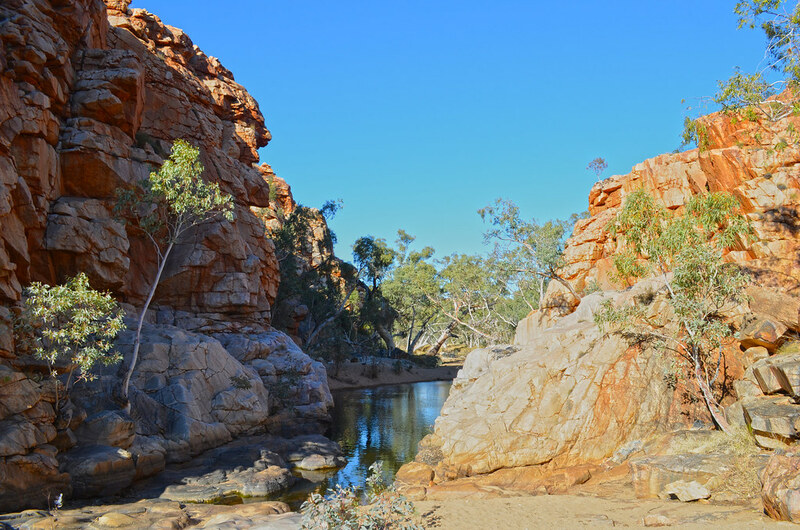 In some places it looks like rocks and boulders have been manually placed in perfect rows, equally spaced apart and interspersed with the different shades of brown and yellow vegetation, then dotted with Mulga and Ghost gums. I wish I knew more about geology and botany so that I could read the stories the landscape tells. “So did Anne tell you much about the geology yesterday?” Elise asks. “Not much,” I answer. She probably did, but there’s been so much to take in already that a bit of repetition is definitely not an issue. Elise points across the valley to a peak that you can clearly see is made up of perfect layers of red rock. I’m getting that feeling of smallness again. The quartzite that makes up these peaks was formed over 1.5 billion years ago. The time we spend on this earth is nothing but an insignificant blip on that scale. 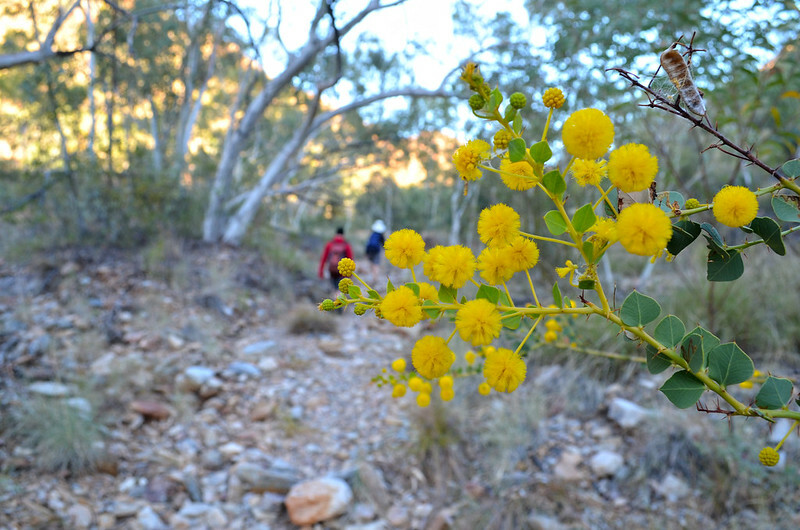 The yellow wattles are one of the many colourful wildflowers we find along the trail. Making our way back up onto the high ridgelines of the Chewings Range. The upturned layers that form the Chewings Range. 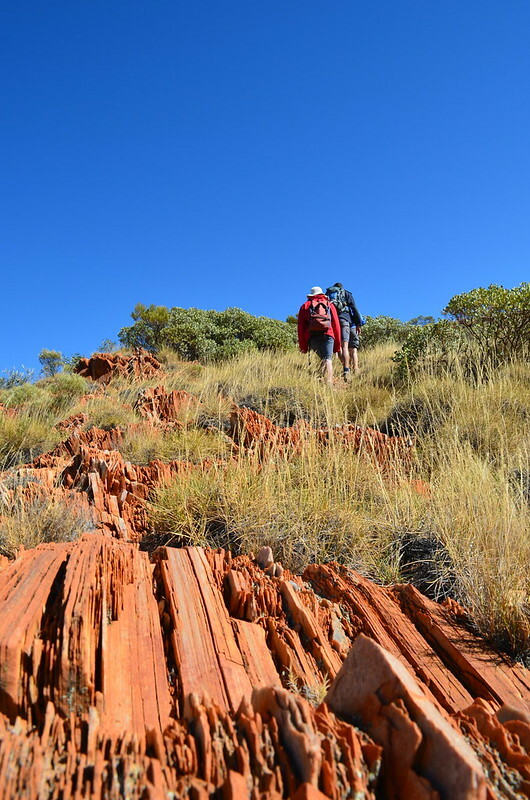 Neil was a guest of Trek Tours Australia on this hike. This does not influence the views put forward here in any way. 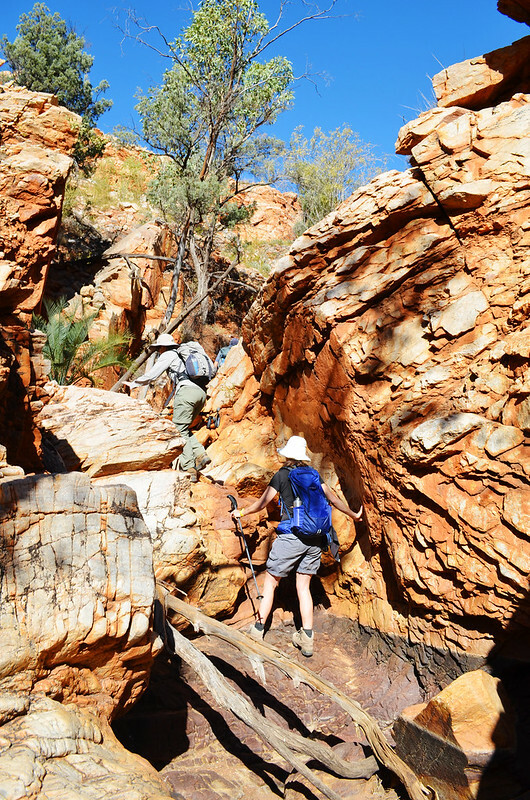 This 6-day guided trip from Trek Tours Australia takes in the six most challenging sections of the trail (sections 3, 4, 5, 8, 9 and 12). 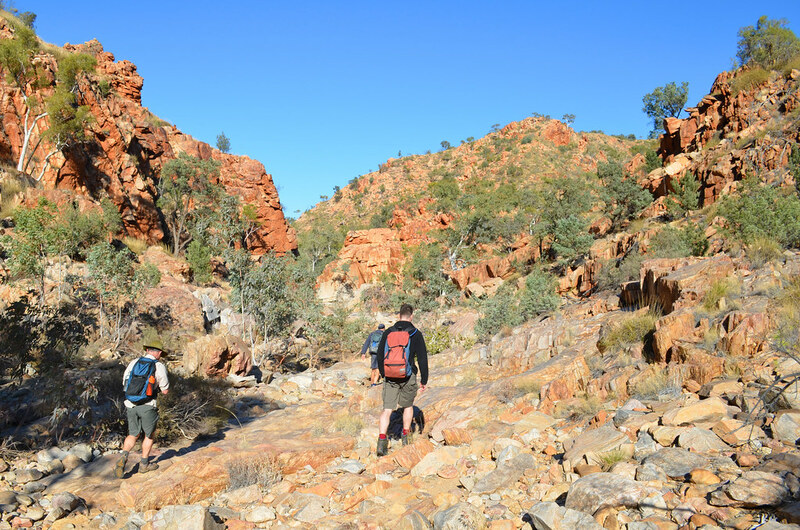 It’s a fantastic way to take on some of Larapinta’s most challenging terrain and enjoy its most spectacular scenery, without the need to thru-hike the entire trail (although I would like to do that one day), or carry your own equipment, food and water. This is a contender for my favourite hiking trip of all time. I can’t recommend it highly enough. Length (km): 107 km (13 km / 17 km / 17 km / 15 km / 29 km / 16km). Time: 6 days (7 – 12 hrs hiking per day). Parks: West MacDonnell National Park. Further Info: Pickup is from accommodation is Alice Springs. Camping equipment is included in the tour price. 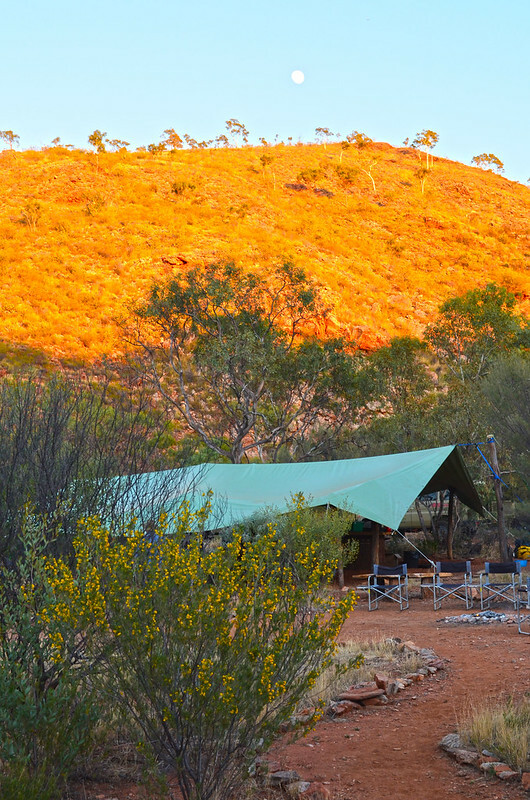 See the Trek Larapinta website for full details and pricing. 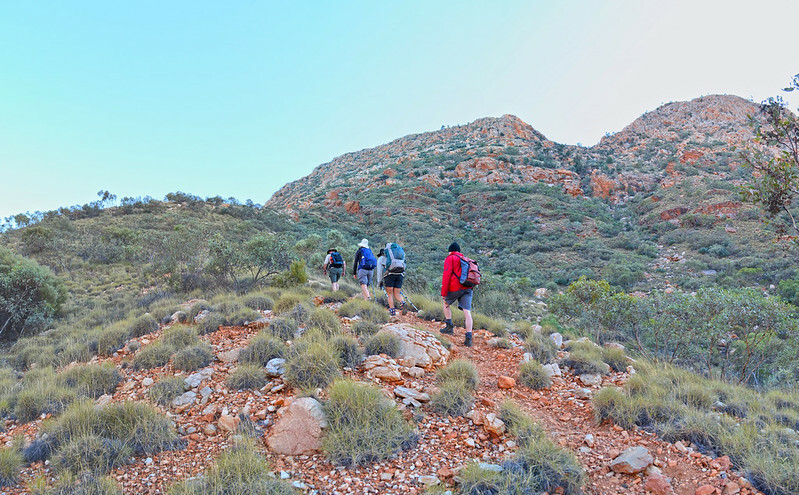 Hiked all or part of Larapinta yourself? 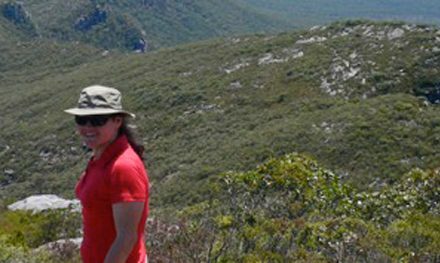 Got questions about my experience with Trek Tours Australia? If you have any stories, questions, updates or corrections, please let us know by commenting below. 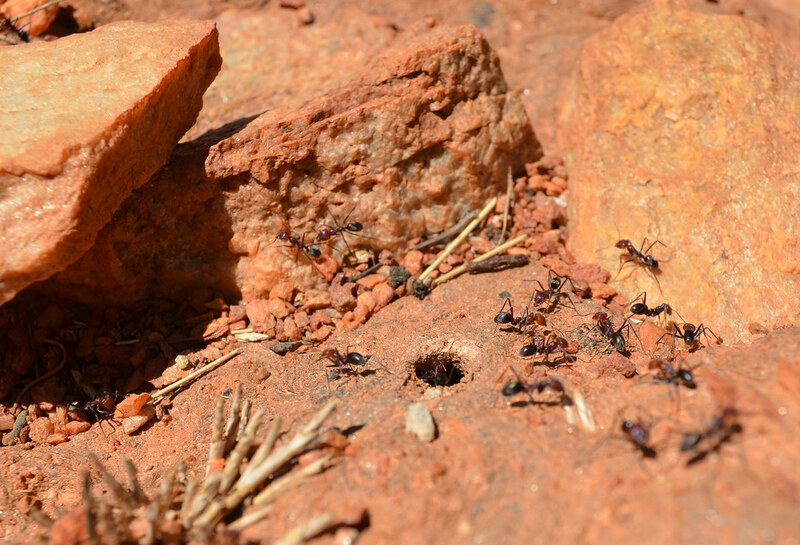 Don’t get me started on those ants… Ouch! Looks like you had a great time. Love the photos! And as I just returned from doing the Larapinta last week I can now totally relate. 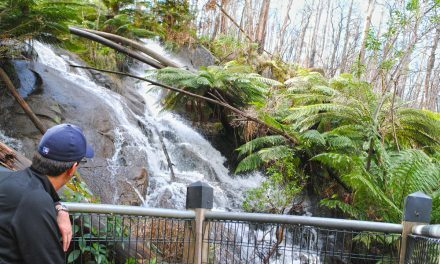 In fact, I think I may have found a renewed love of bushwalking! I did the six-day tour too… haven’t walked that much in years, so surprised myself. And get what you mean about feeling small. It’s an amazing, ancient place. What about those stars at night? Haven’t seen skies like that in a long time. I did! Thank you! 🙂 Which sections did you do on your 6-day trip? 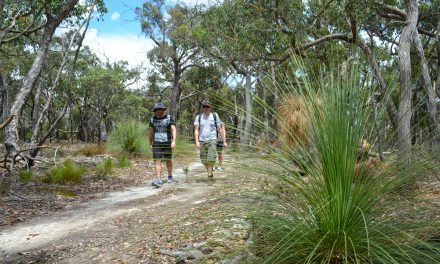 Great to hear it’s renewed your love of bushwalking. Hi Neil – those photos are just fantastic – I have to agree with you, as I did 6 days of it for my 50th this year. Tt is a world class walk, and the sheer ancientness of the land is genuinely indescribable, but you’ve done a great job of it. Looking forward to the next instalments! Larapinta is on my bucket list — not the fanciful, just dreaming bucket list, but the real one and your post has just fired me up even more. Love the colours in your photos. What a magical place. I’m looking forward to your next installment. Great to hear, Sandra! 🙂 Planning to go solo or guided? This is one that I would do as a guided walk. I’m notorious for getting lost and injured etc. and that’s one place I would hate for either of those incidents to happen. 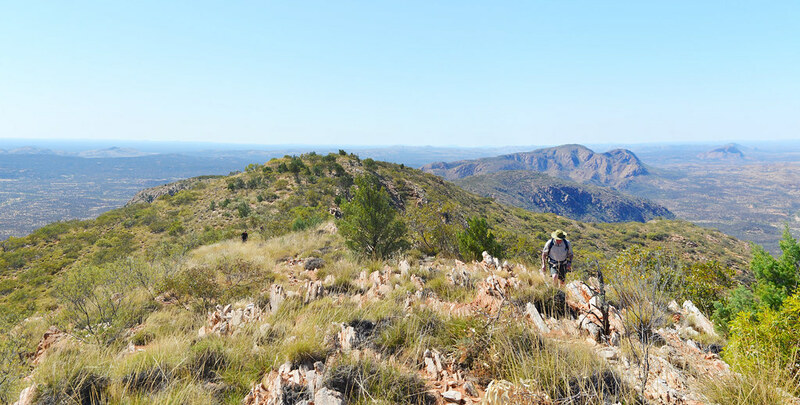 I don’t have enough confidence yet with thru-hiking to take on the full Larapinta on my own. I’d love to learn more about the place and a guide like Anne would be perfect for that, too. It’s amazing isn’t it, Jane!? Tough on the ankles and knees, no doubt, but with a bit of training I’m sure you could do it! My knee is recovering well. The osteo thinks it’s a very small meniscus tear that should heal itself, so I’m mainly working on strengthening the surrounding muscles. Hopefully I’ll be hiking again by the end of September. Fingers crossed! I’ve had the Laparinta trail in my sights for years. It’s just time and money holding me back at the moment. Maybe next year! Gorgeous photos. Looks like you had a great time walking and connecting with nature and fellow outdoor enthusiasts. Looking forward to the next installment.